ZX Spectrum Expansion. . . . Starts with one card . . . . . Extend up to seven cards ! The price/computer power ratio of the Spectrum is tremendous but up to now it's lacked one major thing compared with other Z80, 48k computers costing many times more - expandability. A back to back adaptor needed when you buy your first card and later for the backplane. A buffered 3 slot back plane, meaning it won't interfere with the Spectrums operation. It will generally require an auxilary power supply either home built or the USP-Power supply unit (available later). 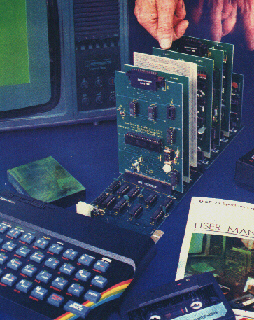 A side connector allows use of the ZX Printer and Microdrives. Prototyping card - use to design and test your own circuits. Dual channel serial RS232 interface using the sophisticated and very powerful Z80DART chip. Includes LPRINT and LLIST patches and a terminal emulator program. Baud rate 75-9600, full handshaking available. General purpose parallel interface using versatile Z80PIO chip. Use to connect to parallel printers, music synthesisers, plotters, D-to-A and A-to-D converters, relays, LED's. . . It provides two 8 bit input or output ports with 4 handshaking lines. A kit for use with the USP-I/O for centronics compatible printers.